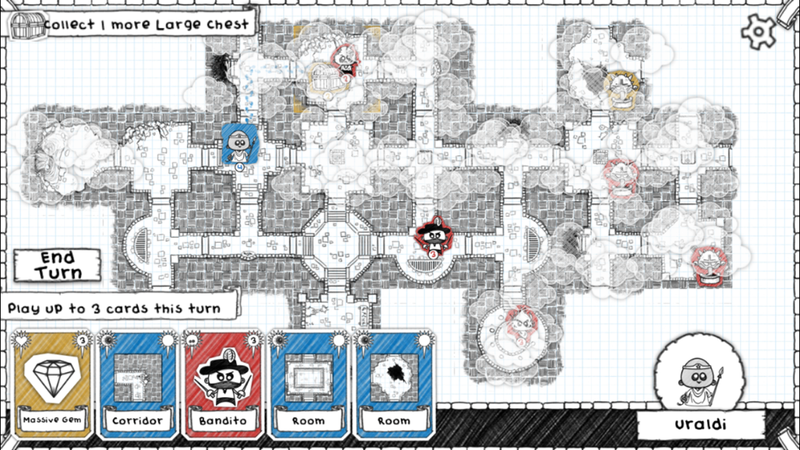 The fact that I finished Gambrinous’ Guild of Dungeoneering despite many distractions — believe it or not — says a lot about the game. In today’s oversaturated App Store, it’s not uncommon for me to start a game and then forget about it the second another one comes along. Every week there are so many games fighting for my attention. Many games that would have easily grabbed me five years ago wouldn’t be able to compete for my attention these days. But if a game can be played in short bursts in between other games, it’s more likely that I’ll stick with it to the end. This also explains why, unintentionally, I find myself playing more puzzle games and fewer lengthy story- and dialogue-driven adventure games. Dungeoneering is a bit like a puzzle game in some some ways and I chipped away at it alongside the brain-melting Snakebird, as both can be played in small chunks. Even after breaks for a couple of walkthroughs, I didn’t forget about it and came back to finish it. While it was originally created for PC, the game translates really well to mobile and touch screens. The main idea is that you run a guild of dungeoneers. All you care about is money. Their lives are worthless outside of the gold they bring to you and the dungeons they manage to clear out. The gold allows you to expand your guild, attracting new classes and equipping them with better, well, equipment. Everything is card-based. When you buy an upgrade for your guild, you’re given a card to drag to wherever you desire, building a new room. This aspect of the game could have used more fleshing out, as the locations don’t seem to matter all that much. There also aren’t that many rooms to buy, and they all look pretty much the same. Perhaps some more strategy in placement would have made it feel more meaningful. But it’s just a small part of the game, so no big deal. 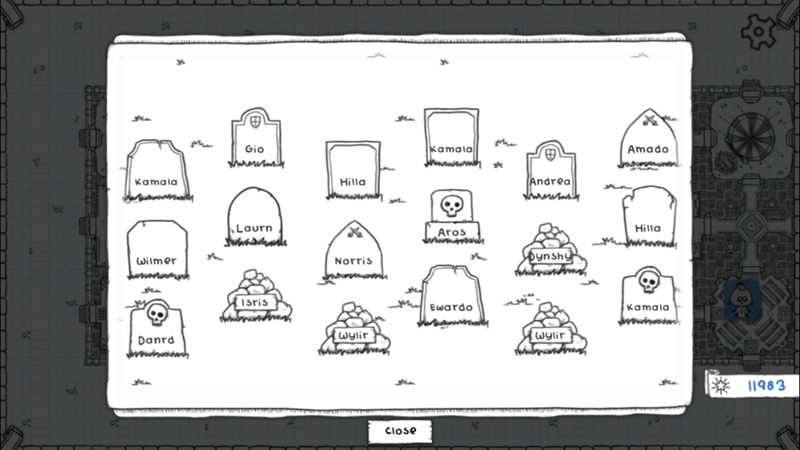 There’s also a trophy room and graveyard where you can see the names of all your fallen dungeoneers, which is a nice little addition. One small issue I had is that if you set the game to fast-forward in order to speed up the battles, the text bubbles also speed up, even in the guild. It’s practically impossible to read them in time, which is a shame because they’re often entertaining if you manage. I would like to see an option to have the speech bubbles stick around a bit longer while everything else remains on hyper speed. Again, it’s a small issue, and I appreciate the inclusion of a faster mode altogether, but it’s a shame to miss those little details. The game itself is broken up into quests. They vary from opening a certain number of chests to defeating a boss, or even reaching the exit in a specified number of moves. You choose a dungeoneer for a mission and off he goes! Cards are central here again, as you use them to build and explore each dungeon. 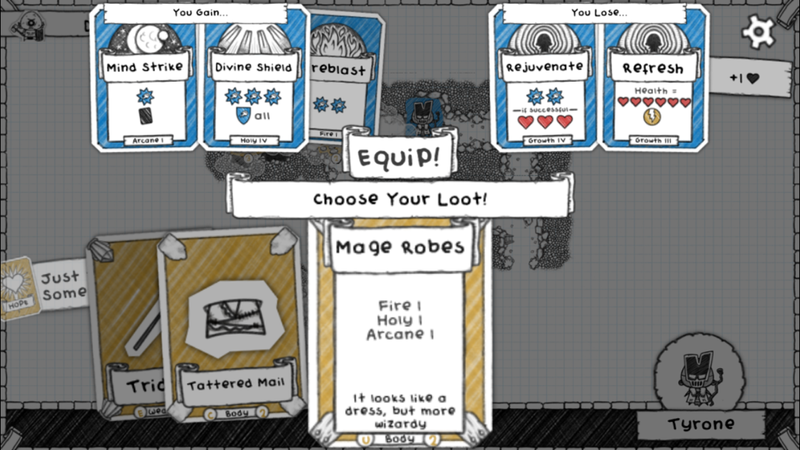 You’re given a few random cards at a time — dungeon rooms, monsters, or gold. You can choose up to three cards per turn and place them on the map, which will have some rooms, gold and monsters on there already. You’re a victim of randomness and luck here, but there is a level of strategy to using the cards you’re given. You can’t directly tell your dungeoneer where to walk. You can only lure him in the direction you want him to go by creating the right path and placing both gold and monsters in the right spots. For instance, all dungeoneers are attracted to gold but most are scared of monsters that are several levels higher than them. So you need to use that information to guide them where you want. When your dungeoneer lands in a room with an enemy, the two will battle. Again, cards come into play. You have a deck of cards made up from the basics you start with, the class-specific cards, and any weapons or accessories you’ve equipped in this dungeon. A card can have magic (blue) or physical (red) attack points, magic or physical defense, or healing. Then there are some that have a penalty such as loss of health to the user. Some cards prevent the opponent from defending, and others allow you to draw more cards. There’s a lot of variety that I can’t cover in detail — so much so, it’s enough to keep things interesting, especially as you unlock new equipment and new classes. Much of the fun comes from discovering new strategies. Enemies always strike first unless you have the Ranged ability or a card with a lightning bolt on it. This adds more to the challenge, as you need to plan your moves carefully so you can counter their attacks. In each dungeon, you need to defeat any enemies you encounter and complete the mission. Many of the cards do the same thing but have different names. Others work very differently than any other cards you encounter. For instance, the Cartomancer has cards that take into account the number of cards in your hand. 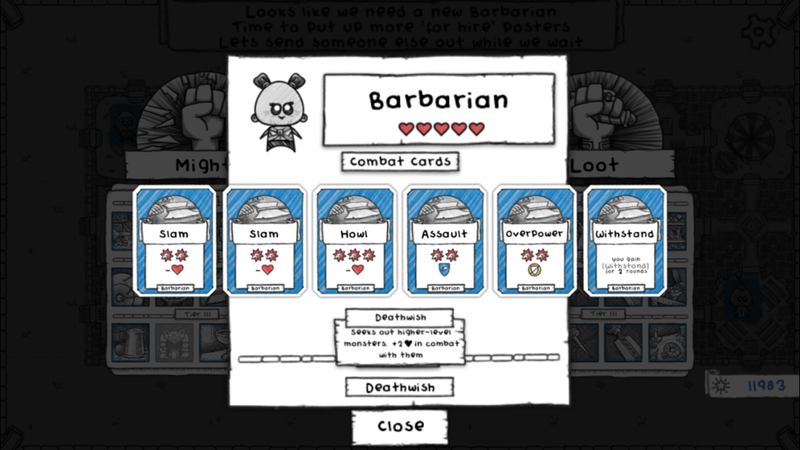 The Barbarian — one of my personal favorites — has a “Withstand” card that prevents him from dying for two turns. 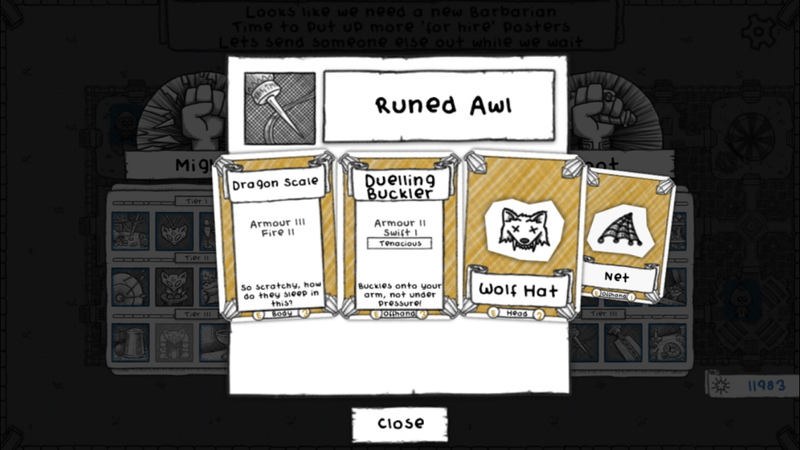 I can’t even tell you how many times that card has saved my Barbarians’ lives and allowed me to complete a quest. 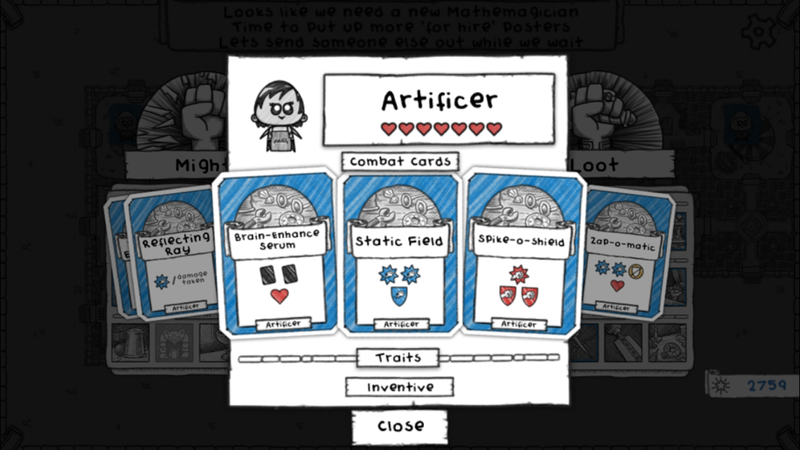 Each enemy you defeat allows you to choose one of several random equipment upgrades, which can give you passive skills and/or add cards to your deck of attacks. As your dungeoneer defeats more monsters, he’ll get stronger and have access to better equipment, giving him a better chance at clearing the mission. If he does so, he’ll live to see another day, earn some battle scars, and you’ll get some gold. You’ll also unlock another mission. If his health runs down to zero and he dies, or he fails the mission (they’re essentially the same thing), he goes to the graveyard and you have to wait for his replacement to arrive. The game is very friendly in this regard, though. You only ever have to wait one mission for a new replacement. So if you have a favorite class, there isn’t much stopping you from using him almost exclusively. But it’s much more interesting to try different classes and learn to make their strengths and weaknesses work for you. I had my favorite dungeoneers by the end of the game, but some that I mostly ignored managed to surprise me when I gave them the time of day. The frustration level is kept low due to death being little more than a minor inconvenience. If you do manage to clear a few missions with a single hero, he’ll earn some traits (or battle scars) that act as passive abilities. Most give you an upper hand in battle (like “pyromaniac,” which starts you with the skill Fire 1), but there are some that can harm you (like “flesh wounds,” which removes one health point from your total). If a dungeoneer dies, he loses those battle scars, but that’s all. They start each dungeon back at level one anyway, so there isn’t much penalty for dying. It definitely makes the random aspects of the game easier to swallow. Weapons and other equipment can also have a negative side effects. 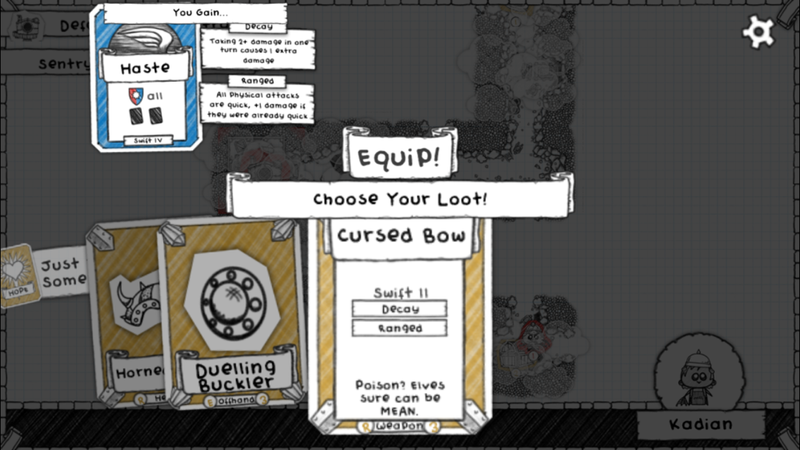 For instance, the Cursed Bow gives you both the Decay and Ranged traits. This means you’ll lose an extra health point for every two damage you take, but all your attacks will be quick. There aren’t many pieces of equipment like this, but you’ll still have to make tough decisions between different weapons or armor. Do you give up a health point for a high-attack card? Do you accept the “Uhh..” card (which is blank) in order to add other useful cards to your deck? I, of course, can’t write a review about this game without mentioning the singing bard. One of the first things that grabbed me when I started playing was the soundtrack. You can hear it in the video posted above. The game is narrated by a bard with a very dark sense of humor. He has a song for all sorts of occasions, including a dungeoneer’s death or success at completing a mission. There are also, as mentioned earlier, little humorous touches throughout in the form of text. Even though it’s a bit small on my iPhone, I appreciated the attention to detail. Even item descriptions often have some humor to them. Sadly, there’s no iCloud saves so you’ll have to choose a device to play on. Things are a bit hard to read on my iPhone, but I managed with it so I could have it on me all the time. Hopefully iCloud will be added in the future for those of us who want to play on our bigger iPads at home. I should also mention that some rules of the game are confusing, especially those governing the path that a dungeoneer will take. Just when I thought I understood them all, I realized there were still some things I hadn’t figured out. Still, I managed to get through the game even without studying every detail. I like to just jump into a game without a manual, and learn through trial and error. 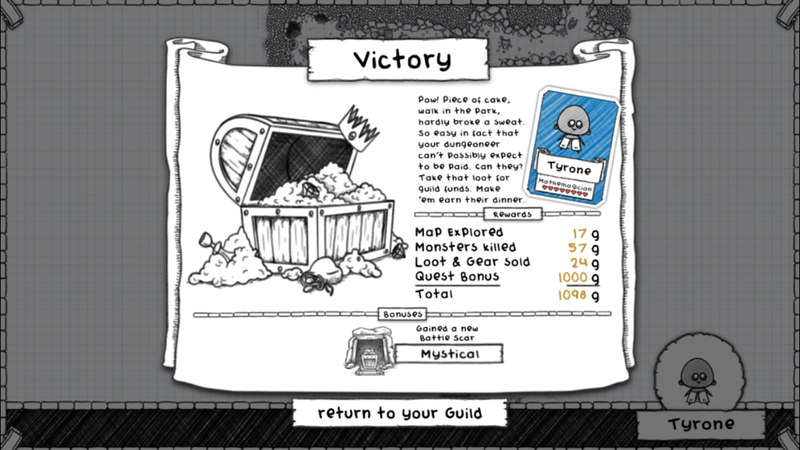 So I’m glad there isn’t much of a penalty for learning from my mistakes in Guild of Dungeoneering. That’s definitely a big reason that I stuck with the game to the end. 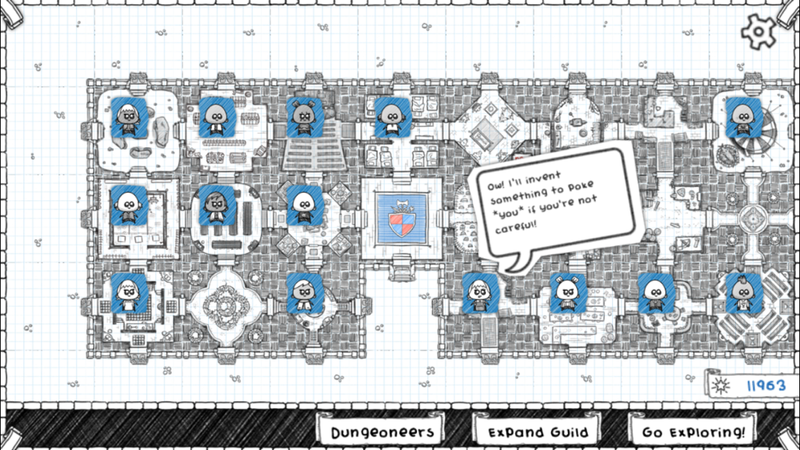 If you’re looking for a mobile-friendly, casual but deep game that you can play anytime and anywhere, I highly recommend Guild of Dungeoneering. Any imperfections and issues weren’t enough to hamper my enjoyment of the game. Even when I got stuck and had corpses piling up in my guild, I didn’t get discouraged. Sometimes all you need is to grind a bit to unlock a new class or tier of equipment in order to push you past that sticking point. And sometimes you just need a little more luck on your side. Either way, it’s a fast-paced turn-based game that doesn’t waste your time. If you only have a few minutes to play at a time, it respects that. But you can easily get lost in it for an hour or more. Also, the developers have content updates planned, which will be free for anyone who already owns the game. Instead of sales, they plan to raise the price of the app each time they add content. So the earlier you buy, the cheaper it will be. If this all sounds good to you, go ahead and download the game here. OMGoodness! That’s me too! Start a game but another comes along and I forget the ones I’ve started!! Haha there are too many games!